Calendars 5 for iPhone and iPad (App Store link), currently at version 5.2, is a very good upgrade to Readdle’s venerable Calendars+ app. Though released prior to iOS 7, the new $7 app fits right in with the newest version of iOS. While calendar-app preferences vary widely with individual needs and circumstances, Calendars 5 has four primary strengths: It has an excellent task manager; it offers a logical, easy-to-use event-entry system; it plays well with both Google Calendar and Apple’s built-in Calendar and Reminders apps; and it sports a simple interface that’s easy on the eyes. Calendars 5’s Week view on the iPhone provides a clear view of your schedule while also allowing you to add events as simply as in the iPad view. You enter events in Calendars 5 by either tapping the “+” sign in the upper-right corner of the screen, or by tapping-and-holding on a time or date on the main calendar. A pop-up box appears providing a variety of options for entering locations and notes, and to make events recurring. You can also be alerted of reminders using alert sounds, email, and SMS messages. The app remembers frequently-used locations, and it provides a list of likely candidates as you type. When you tap the location icon in an already-entered event, Apple’s Maps app opens, displaying the location. Unfortunately, there’s no option to use an alternate maps app, such as Google Maps. 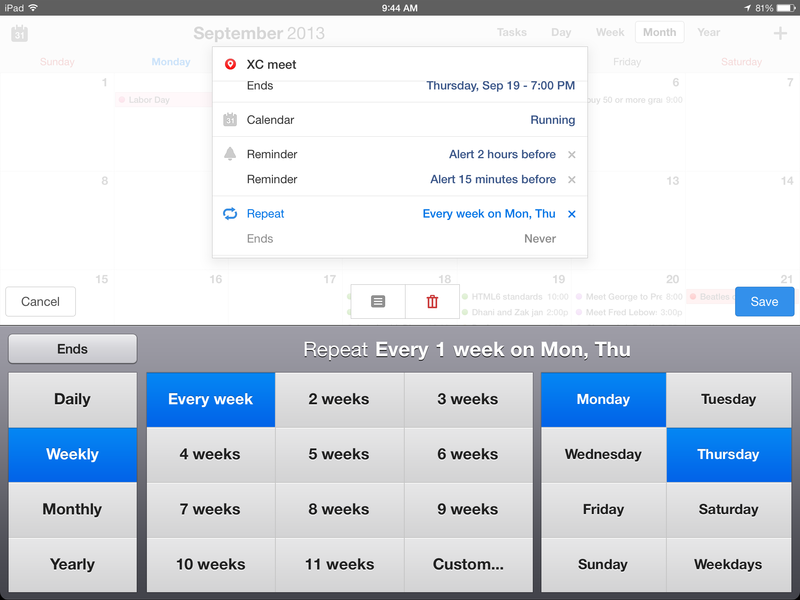 The Month view on the iPad is simple and elegant, and it provides easy access to the app’s tools. 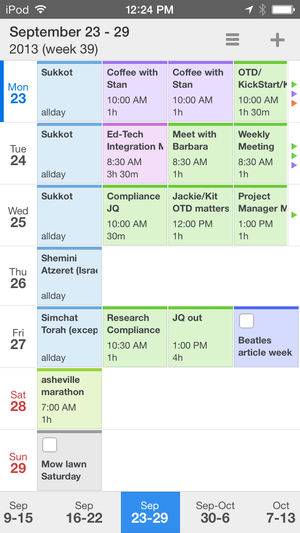 Events and tasks are color coded, and in the calendar view, tasks appear at the top of each day with a checkbox. It’s easy to switch between daily, weekly, monthly, yearly, and task views, and each view looks excellent in portrait as well as landscape orientation on the iPad. On the iPhone, the task, day, and week views are much easier to view in portrait mode, while the month view is better in landscape orientation. 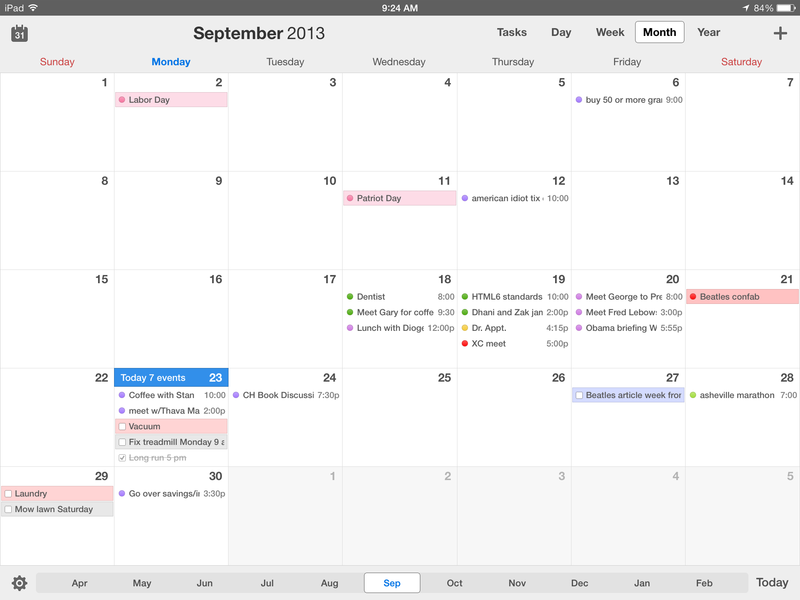 Readdle touts Calendar 5’s “natural language input” capabilities, but I found the app to be inconsistent in this area. For example, on a Sunday I added a task by entering “Fix treadmill Monday 9am.” The task was placed in my list of tasks for Sunday, and appeared the same way in the calendar view. In another instance, entering an event for “8:30-noon” was not interpreted correctly—the event appeared in the calendar with the default event length of one hour. The touted natural-language input method did not work multiple other times in my testing, even when the language I used was precise. When you add a task or event, easy-to-use options let you add notes, add multiple reminders, and—as shown here—designate even complex recurring events. That said, while Calendars 5 falls short of an app such as Fantastical in this area, the app does a better job than most other calendar apps—many don’t attempt to interpret “natural language” at all, and those that do typically rely on a somewhat idiosyncratic shorthand that users must learn by trial and error, with many attempts requiring post-entry fixes. Calendars 5 is not a free upgrade for those using Readdle’s Calendars+, but if you’re already using the older app, you’re likely to find the new version to be worth your money. It includes plenty of notable improvements, it looks terrific, and the price gets you a version that works with both iPhone and iPad, with the device-specific features distinct (and good) enough to be worth paying for separately. 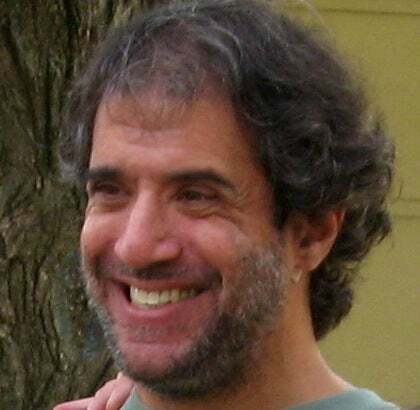 In addition, Readdle has a consistent record of providing frequent, useful upgrades. Calendars 5 is an impressive calendar app for iOS that looks terrific, offers easy-to-use features, and works equally well on iPhone and iPad.